There’s something to be said for a product that blurs the lines between professional grade and domestic use. There doesn’t have to be a clear distinction between the two, although in many cases industrial strength products are overkill for the average consumer. That certainly applies in the case of chainsaws. Professional chainsaws are behemoths that are designed for some heavy-duty wood cutting. There aren’t many chainsaws that professional tree cutters would even consider. One product that’s designed for use by the average homeowner that might give professionals pause for thought is the Husqvarna 460 Rancher. 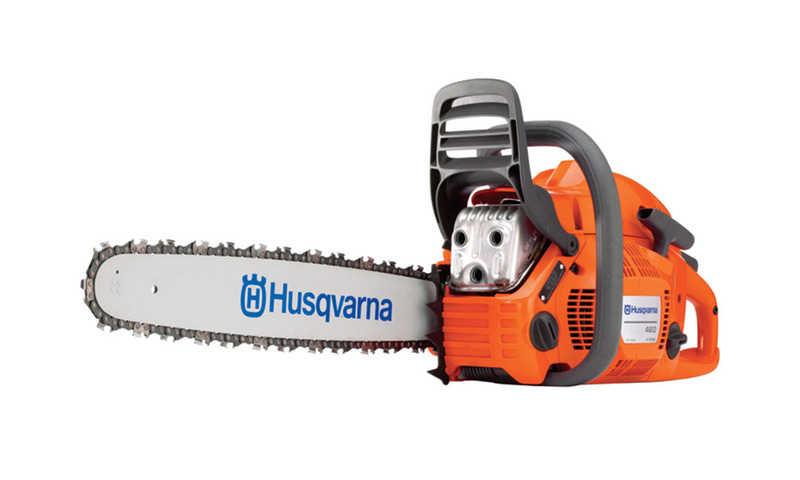 We do review a couple of other Husqvarna chainsaws on this site, but this is clearly their best consumer grade product. It’s a powerful machine, but you will have to pay a little more for it. This model will likely run you somewhere between $500 and $600. A quality chainsaw needs to have a chain that’s designed to stay tight enough even after several tough cuts. This one has a side-mounted tensioner that’s easily accessible and allows for quick and easy minor adjustments. It may loosen up after regular use, but it won’t take you long to get it back in line again. You still have to keep an eye out for problems, but even someone with very little mechanical knowledge can make the necessary adjustments without any problems. My last car’s air filter was very difficult to access, which made changing it a pain. I’ll admit I tended to avoid the job until it was absolutely necessary. That’s not a god policy to follow and, fortunately, this Husqvarna 460 Rancher makes it a lot easier to change the air filter. It has a quick release feature that allows you to access and change the air filter in a matter of seconds. If the manufacturers of that old car of mine had made the filter as easily accessible as this one I would have changed my filter much more regularly. This a durable and rugged saw that can handle some tough jobs. It has a forged 3-piece crankshaft that’s designed for maximum longevity. It has overwhelmingly positive reviews because it was built to last. The motor casing is made of a strong plastic that’s designed to resist cracking even in harsh environments. This chainsaw is equipped with one of the longest chain bars available on consumer grade chainsaws. The bar measures 20-inches, which will give you plenty of length to reach those higher branches, making your chore a lot easier. You probably won’t be able to use this to cut down a redwood, but it will handle just about any backyard job you can find for it. Generally, when I head out in the yard to do some trimming and pruning I expect to spend a couple of hours at it. With that in mind, it’s essential to have a chainsaw that is ergonomically designed. The Rancher has a streamlined body that fits snugly against your midsection, and handles that are ideally positioned for comfortable use. You’re bound to feel a bit of strain, but it shouldn’t be anything you can’t handle. This machine has an impressive X-Torq engine that’s capable of handling some hard-core wood cutting activities. The engine operates at up to 9600 RPMs, which gives it enough juice to cut through some large branches and logs. You probably won’t be disappointed with the power it produces – it’s a lot more than the average consumer chainsaw. Dealing with vibration is one of the biggest problems that most of us have to put up with when using a chainsaw. Like most Husqvarna chainsaws, this one is designed with low vibration technology to soften the impact. The handles are cushioned and it has built-in shock absorbers that protect you from the worst of the vibrations. The engine is also encased in a solid motor housing, which helps to further reduce vibration. You will still feel some vibration, but it’s minimal. Like other Husqvarna chainsaws the Rancher comes with a standard two-year warranty, but it can be upgraded. If you buy oil from the manufacturer and register your chainsaw you can upgrade to a four-year warranty. It’s well worth taking advantage of this deal. There will always be some dissatisfied customers. There aren’t many with a lot of negative things to say about this chainsaw, but there are some. Chief among those complaints is the assertion that this machine can be a little temperamental. When it’s running smoothly it does a great job, but some have experienced some stalling issues. A couple of customers have also expressed dissatisfaction with the level of service offered by Husqvarna. However, most customers are very satisfied after purchasing this chainsaw. The Husqvarna 460 Rancher is a good consumer grade chainsaw. It’s durable, powerful, and has a nice, long reach. The ergonomic features designed to reduce the impact of vibrations on your body are nice to see, and it’s relatively lightweight as well. When you throw in the fact that it has an easy-change air filter system and a competitive warranty, it isn’t hard to recommend this machine. It’s easily one of the better chainsaws available for the consumer market and one that clearly belongs on anyone’s shortlist.